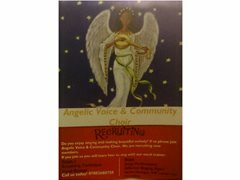 Angelic Voice and Community Choir is looking for a male and female singer to join us. We are looking for someone who is able to harmonize vocally, someone who has a good hear for all music particularly gospel music and classical music. Angelic Voice and Community Choir is a charitable choir, that serves the community throughout the London and outer London area. Opportunity to sing and gain experience in charitable work. We are looking for enthusiastic singers who are not afraid to learn new things and singer who have good hear for harmonising.